RICHMOND has held on to win a highly entertaining game by seven points at Adelaide Oval on Saturday evening in front of a big crowd. The Tigers pressure was manic early on and caused all sorts of problems for the Power, which struggled to get the ball clear of defence. Tom Lynch missed a 50-metre set-shot inside the opening minute and Brad Ebert showed him how it was done 90 seconds later when he got on the end of a quick build-up down the outer wing and finished from 15 metres out. Josh Caddy levelled for the visitors with a snap from the pocket but the Power was simply more efficient with Robbie Gray slotting a neat set shot with the outside of his boot and Sam Gray nailing back to back majors to open up a 15-point lead. Another Caddy goal late, after a brilliant turnover by young Noah Balta brought the margin back to just eight points at the first change. With their “Big Four” of Jack Riewoldt, Trent Cotchin, Dustin Martin and Alex Rance all missing, the Tigers looked to first gamer Jack Ross to provide a spark and he delivered with a heap of second quarter possessions to have 16 to half time. The Power again skipped out to a 16-point lead with goals to Ebert and Ollie Wines before the visitors fired back through consecutive goals to Lynch and Shai Bolton, before Sam Powell-Pepper halted the momentum with a goal-of-the-day contender, quickly firing the ball to his boot from height on the goal line. The Tigers were dominating the clearances and the inside 50s, and were rewarded when a late goal to Brandon Ellis brought the margin back to just one point at the main break. A free kick to Paddy Ryder saw the Power open the scoring for the second half with the big man calmly slotting home from outside 50. But a crazy 30 second period which saw Tom Lynch run into an open goal for his second, then earn a free kick for a push in the back by Ryan Burton as he booted the goal to slot his third and the Tigers hit the front. Lynch booted another after roving in the goal square to end a chain of four straight Richmond goals which saw the visitors out to a 15-point lead but a moment of madness from Kamdyn McIntosh in which his misplaced pass saw Travis Boak pounce inside 50 and a goal to Sam Gray – his third for the game. 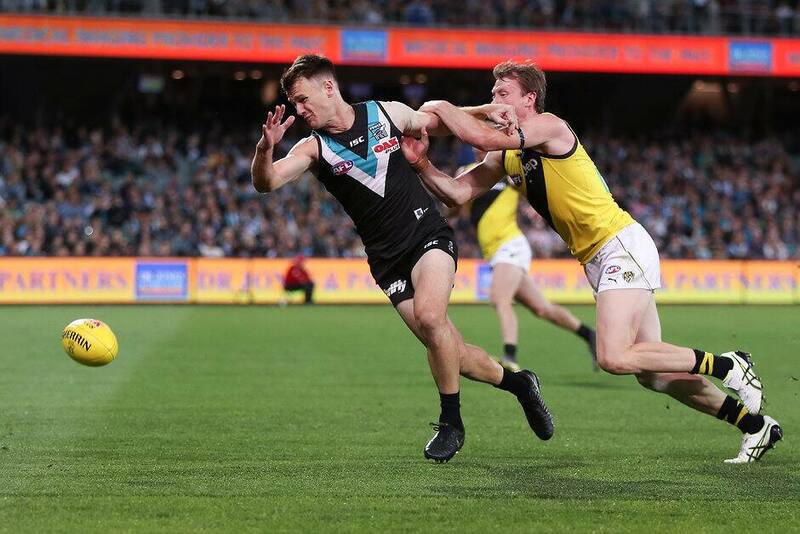 Burton goaled from the pocket to redeem himself and free-kick goals to Toby Nankervis and Robbie Gray, after a video review to see if his shot hit the post, saw the Tigers holding a two-point lead at the final change. It was a slow start to the final term but a controversial 50 metre penalty to Lynch saw him boot his fifth major for the evening. A free kick to Willem Drew 25 metres out from goal saw the young midfielder boot the first goal of his AFL career in just his fourth game and the margin return to just two points, and when Ollie Wines ran into an open goal after a mistake by Tigers defender Sydney Stack, the Power had the momentum in front of nearly 40,000 at Adelaide Oval. A clever toe poke by Josh Caddy put the visitors back in front in a see-sawing conclusion to an entertaining evening. Dan Houston intercepted a Dylan Grimes kick in the defensive half to give the home side back the lead with under three minutes remaining, but Tom Lynch sealed victory with his sixth as the visitors ran out 92-99 winners.